He was wearing his hallmark colorful hat and a broad smile upon reaching a funeral in a car riddled with bullets. 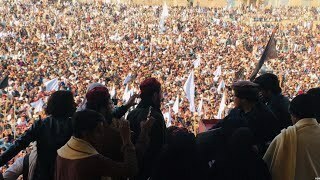 Manzoor Pashteen, the charismatic young leader of the Pashtun Tahaffuz (safety) Movement, has been battling the powerful military establishment in Pakistan for the rights of his fellow ethnic Pashtuns who are currently facing alleged forced disappearances and extra-judicial killings on top of constant discrimination, persecution and violations of rights. When one of his fellow PTM activists, Prof. Ibrahim Arman Luni, was allegedly killed by security forces in the restive Baluchistan province, Pashteen was not even allowed to attend the funeral. But, the PTM workers presented their chests to the security forces, seen in viral videos not allowing their leaders – including two parliamentarians, Mohsin Dawar and Ali Wazir – to console the grieving family of Prof. Luni. The car Pashteen was travelling in was also shot at. This grass-roots movement has gained momentum following the killing of a young ethnic Pashtun man in Pakistan’s biggest city of Karachi, has been denied any media coverage in Pakistan. Due to evident pressure from the country’s powerful security establishment, the private and public media are forced to hide the massive rallies and demonstration the PTM has been holding in some of the remote corners in the country. This brazen oppressive policy was unveiled on Tuesday when the PTM workers were beaten and arrested by police outside the National Press Club in the capital, Islamabad. But a similar demonstration at the same venue and at the same time to mark Kashmir Day was facilitated. It marks an official holiday in Pakistan which is observed to highlight human rights violations by Indian security forces in Indian-administered Kashmir. The sheer irony of propagating one thing for Kashmiris in India while denying the same rights to its own citizens in Pakistan is utterly bizarre. The government in Islamabad only came out in public to own the PTM and vowed to address its concerns when neighbouring Afghanistan raised its voice for the Pashtuns, just as Pakistan does for Kashmiris. The Afghan President, Mohammad Ashraf Ghani’s tweet expressing concerns over crackdown on PTM was harshly criticized by Pakistani officials as interference. In response, Amnesty International has urged the Pakistani authorities to immediately and unconditionally release protestors belonging to the peaceful Pashtun Tahaffuz Movement (PTM) who have been arbitrarily detained. No one likes the AfD. But the Berlinale sees an opportunity to reducate them. In what remains to be the world’s largest attempt to address plastic waste, nations have come together to launch an end plastic waste movement. The UK's image of a liberal and tolerant country should forever be shredded. It is opportunistic and racist; a path that we know never ends well. Asylum seekers citing domestic abuse remain in limbo in U.S.
U.S. gov't policy denying asylum requests based on domestic violence leaves thousands of vulnerable Central American women in fear of deportation. Our economy is broken, with hundreds of millions of people living in extreme poverty while huge rewards go to those at the very top. Earlier last week, a video began to circulate on social media – a video which seemed to ignite every proverbial bonfire across the U.S. and . the U.K.